Is The Amalfi Coast Truly a Good Day Trip? — Sapphire & Elm Travel Co. Chances are you’re familiar with Italy’s Amalfi Coast. In fact, within the last few years the Amalfi Coast has soared to rank in the world’s most famous and romantic places in Europe alongside Paris, Rome, London, and Barcelona. Stunning images of Amalfi’s rugged and charming coastline have graced thousands of magazines, websites, blogs and social media channels for good reason; it is one of the most charismatic and sophisticated coast lines in the world. Ancient, elegant homes sit atop of grandiose sheer cliff sides which grace blue skies and blue waters; it’s a sight hard to beat. Colorful umbrellas provide welcome shade in the summer heat. Around every corner people are indulging in espresso and gelato, even in their bathing suits without a care in the world as only Italians, I think, know how. In Amalfi it’s hard to step away from the feelings of warm summer nights and carefreeness of youth. It’s Italian luxury, history, vibrancy and nostalgia rolled into one fantastic place. During my (Stephanie) European Summer of 2017, I was trying to get from Morocco to Greece, and decided my best course of action was an extended layover in Italy. Rough life, I know. I decided I would spend my five-day layover in Naples as I had ruled out other Italian cities I’d already visiting which included Rome, Venice, Florence and Milan. Additionally, I heard nothing but wonderful things about the pizza in Naples and the many day trips you could do using Naples as a home base such as to Pompeii/Mount Vesuvius and the Amalfi Coast. My flight landed in Rome, then I took an immediate bus to the city center and subsequent train to Naples. With five days in Naples, a few were spent wandering the city eating all the pizza and gelato I could make room for, and the other two days were dedicated to day trips; one to Mount Vesuvius volcano and the city it of Pompeii it destroyed 2,000 years ago, and the other to the alluring seaside towns of the Amalfi Coast. But I was about to find out, was the Amalfi Coast truly a good day trip from Naples? The Amalfi Coast is a 30 mile (48 km) idyllic stretch of coastline that runs on the southern coast of the Salerno Gulf on the Tyrrhenian Sea, between the well known towns Sorrento on the west and Salerno on the east however neither of those towns are actually part of the Amalfi Coast. The region actually stretches from Positano on the left, and Vietri Sul Mare on the right. To get to Amalfi you’ll pass through the small quaint town of Sorrento. Many consider Sorrento to be part of Amalfi Coast, however it’s not as the Amalfi Coast is the coastline to the south of the Gulf of Salerno and Sorrento is located in the Bay of Naples. The Amalfi Coast is such a stunning area that this popular destination was named a UNESCO World Heritage Site as a cultural landscape in 1997. The Amalfi Coast is dotted with many quaint towns. The town of Amalfi is possibly the most famous town of the Amalfi Coast due to it’s shared name. It’s smack dab in the middle of the Amalfi coast – 40 minutes from Sorrento to the west and 40 minutes from Salerno to the east, making it good to explore others parts of the region too. Together with the island of Capri, Positano is the most exclusive and chic locations on the Amalfi Coast, boasting the iconic sophisticated atmosphere for which the Amalfi Coast is famous. Known for it’s pastel colored cliffside houses, central location and nightlife. A mountaintop town with cultured villas, Ravello sits slightly aback from the coast. It doesn’t have direct beach access but it does have less tourists. While not actually on the Amalfi Coast since it sits not on the Gulf of Naples, Sorrento is the transportation hub so it’s typically the home base for day trips to other parts of the coast, meaning it’s quite touristy. At the other end of the Almafi Coast from Sorrento is Salerno. Since it’s on the furthest end it’s less visited (touristy) and expensive. Again, while not actually on the Amalf Coast as it’s an island, it is worth mentioning. The island of Capri was once a destination for ancient Roman emperors, and today you’ll find it still attracts the uber wealthy. This small 4-mile island is very popular during the day with cruises and other day trippers, so be sure to spend the night on the island to truly experience it’s magic. Other towns of Amalfi include Cetara, Atrani, Praiano, Furore, Minori, and Tivoli. Similar to the rest of Europe, the best time to visit is May to October; however, July and August can be very crowded due to hoards of tourists and families on summer vacation. Additionally, some restaurant and hotels close from November to Easter. To get to the Amalfi Coast, the most efficient way to get here is to pass through Naples. From Naples, you can rent a car and drive, take a train to Sorrento then a boat to one of the seaside villages, or take a bus to any number of towns directly. 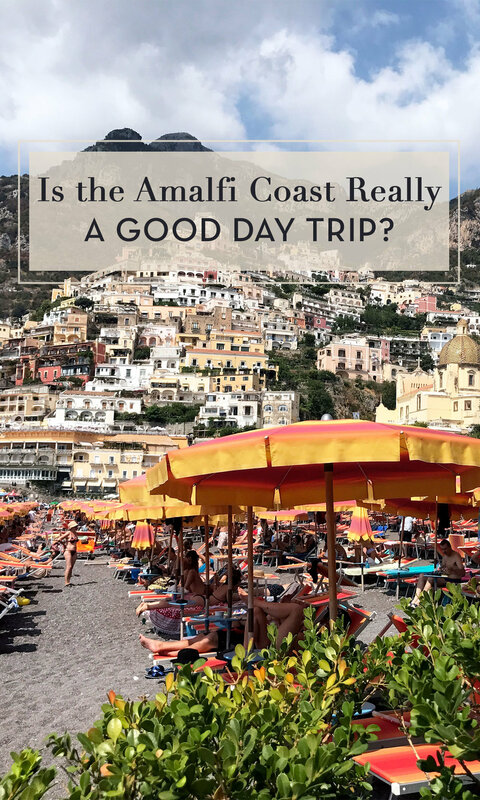 So here’s the question, is the Amalfi Coast really a good day trip? Is it a place that can be seen, experienced, and soaked up in one day? 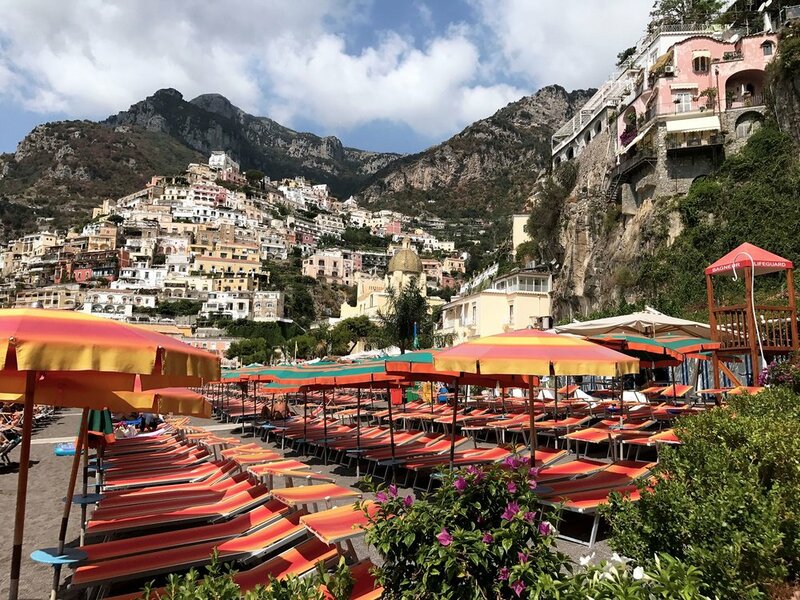 There is so much to see along the Amalfi Coast and to experience it all in just one day would be challenging, however it is possible as I did manage to see Sorrento, Positano and Amalfi in one day. I had an espresso atop the cliffs of Sorrento in the morning, tried my first Apero Spritz seaside in the early afternoon in Positano, and ate pasta and drank wine in Amalfi in the early evening, then made it all the way back to Naples on the two-hour train ride. Although seeing several towns is possible, you will be rushing. I spent only 2ish hours in each destination. I chose to do this instead of a full day in one town so that I could see the differences between three of the most popular places in the Amalfi Coast in order to give more accurate information and recommendations for our clients. My hope for you is that you give Amalfi time. Time to wander the charming streets, to swim in a cave and take the boat back as the sun is setting, to leisurely shop for ceramics, to discover a cove of this Italian seaside that isn’t overrun with tourists, to appreciate the beauty of this magnetic coast. Can't put off a trip to Italy any longer? You shouldn't have to! Contact us to plan your one-of-a-kind trip based on first-hand knowledge and experience.